While I may not necessarily agree as to how Spaniards Heid characterize their music (I hear little of raging Norwegian black metal here), I certainly enjoyed their interpretation of pagan metal on their debut EP Voces De La Tierra Dormida. The EP shows that blackened music with traditional Spanish overtones, with Spanish lyrics and dedicated to Castilian and Iberian history and mythology is just as interesting as Scandinavian, Ukrainian, or any other “native” metal there is. Pagan metal knows no national boundaries, and as long as it is well done it can be a window into a country’s, region’s or nation’s soul. As long as it is well done, and Heid’s material is certainly quality. The band does not wait long to announce their origin and allegiances. No Habra Paz opens up with a flute solo and hand percussion (tambourine? ), while blending acoustic guitars hint at flamenco. The storm is definitely brewing, you can feel the tension, and the track does explode eventually around 2.5 min in. Heid’s bottom end is unquestionably heavy, with some intermittent blasting making appearance, the whole of the song continually pressing down with its bold and pensive melody. Yet there is no abatement in the traditional motif, which makes No Habra Paz pretty special and probably my favorite cut on the EP. Heid do want to make sure their claims of “raging” don’t go unsubstantiated. After Summoning-like intro Golpejar polka thrashes off to war, as a mad berserk, but there is no Finntroll-like silliness in the Heid’s approach. Ruido de Batalla (Golpejar Pt. 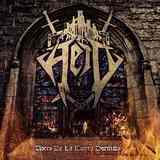 II) continues on, alternating blackened blast with a doomy stomp, probably the heaviest cut on the album, but Heid’s black metal is more tragic and epic than raging or slicing. After all, a pair of these tracks deal with the story of El Cid, the figure both romantic, idealized, and at the same time tragic, as far as Spanish history is concerned. Low deathly vocals are also another element not quite fitting the pure blackness scheme, Ivan Herrero sounding almost noble and above the fray with his growls. Brutal D-beating thrash of La Mano Negra is grounded back into more palatable acceptance by flute and acoustic playing to close out its mystical story. The closer El Canto de Los Responsos brings us back full circle to where No Habra Paz started. Moutharp, violin, other string instruments play native themes, heavy background is swelling with pride, and soldiers march off to war in an epic fashion. I still do not hear (even latter day) Immortal on Voces De La Tierra Dormida, but Heidevolk and Arkona are very valid comparison, especially the Dutch crew. Another band which came to mind repeatedly was Cruachan. I guess there are enough common notes in Celtic/Gaelic and Iberian cultures that do invoke one while listening to the other.